The Piedmont Health Foundation is excited to bring you aboard Greenville’s public transit system, Greenlink. Catch one of Greenlink’s buses to the downtown Greenlink Transit Center for a one hour presentation about Greenlink’s operations, changes, and future. 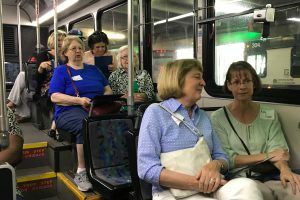 The whole experience takes about two hours when including the time spent traveling to and from the Transit Center on a Greenlink bus. Remember to bring $3.00 in exact change to buy your ticket to and from the Transit Center. Lunch will be provided. Read more about the field trips! To plan your bus ride, please use Google Transit and check your departure time with Greenlink’s posted schedules. Remember to show up your stop ten minutes early to prevent missing your bus. If you have any questions, dietary restrictions, or would like to book a group trip, email Sean Rusnak at seanrusnak@piedmonthealthfoundation.org or call (864) 752-8888.